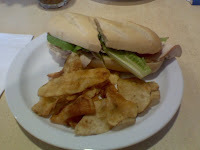 Review by Vegan's Nightmare: I had the opportunity to have lunch at Spoons Gourmet Deli the other day, which is located at 4093 Commercial St. SE, just south of Browning Ave in a small strip mall. The deli is very clean, has an upscale feel with local artwork on the walls, and a balanced lunch menu of fresh gourmet salads and yummy sandwiches (the kind of sandwiches with the really good artisan bread too, not Wonder bread). I had some difficulty deciding on a sandwich because they all sounded good, but eventually I settled on the Turkey Pesto on baguette, which came with turkey breast, lettuce, tomato, and pesto, and a handful of potato chips. My lunch companion had the turkey brie with lettuce, tomato, mayo and dijon on a ciabatta. The sandwiches are excellent, although I kind of felt like there needed to be something else on the plate – like maybe a pickle or something. There's nothing like a good dill. The prices are reasonable at $6.95 for all of the sandwiches, and between $5 and $8 for salads. My next visit will definitely include a side salad instead of just the sandwich – I think I missed out on some good stuff from that side of the menu. Spoons has a warm, comfortable atmosphere, with friendly service and great sandwiches. I haven’t had a chance to eat dinner there yet, but the menu has a bunch of pasta items I can’t wait to try! If you’ve had dinner there, let us all know how it was by posting some comments. According to their web site, Spoons is open everyday at 11am - 3pm except for Sunday. 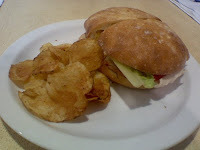 I love their cranberry chicken sandwich and caprese salad!